The Future Rice Strategy for India presents forward-looking insights toward achieving sustainable development of the rice sector, ensuring future food and nutritional security. As a staple food for many in India, including the economically disadvantaged, there are many concerns that affect the development of rice sector. Facing issues from environmental demands to economic stagnation, access to food, food inflation, and the Food Security Act (demand – supply – distribution of rice) achieving sustainability in production and exports is an important and urgent challenge. 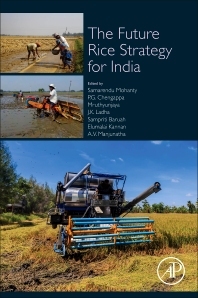 Using case studies to illustrate existing and potential issues, challenges and solutions, The Future Rice Strategy for India presents key strategic options while considering the implicit consequences. In addition, the findings enrich the strategy and policy formulation considerations for the role of rice in the country. This multidisciplinary approach features the expertise of rice scientists covering different aspects of rice sector; from breeding to consumer preferences and markets and trade. Parvesh Chandna, GIS Specialist, IRRI; Elumalai Kannan, Assistant Professor, ISEC and P. Samal, Principal Scientist, Central Rice Research Institute, Cuttack. Suggested contents to be included in this chapter. As head of the Social Sciences Division, Sam recruits and retains quality staff and create a conducive environment for research and professional development and conduct research on all aspects of rice including marketing, policy and trade and impact assessment. Dr P G Chengappa is one of the leading Agricultural Economists of the country. He obtained his PhD in Agricultural Economics from the Indian Agricultural Research Institute, New Delhi. He underwent a course on International Agricultural Marketing at DSE Germany. Dr Chengappa has over 37 Years of experience in teaching, research, extension and academic administration, including research carried out in international organizations. Chengappa started his career as a Research Assistant in the University of Agricultural Sciences, Bangalore, India and served as Associate Professor, Professor and Head of the department of Agricultural Marketing, Cooperation and Agribusiness for over two decades. He rose to become the Director of Instruction (Agril) and Vice Chancellor of the University in 2007. During his tenure as Vice Chancellor the University of was rated as third best Agricultural University in the country by the Times group. He was awarded the prestigious National Professor by the of Indian Council of Agricultural Research which he completed recently at the Institute for Social and Economic Change, Bangalore, India. Chengappa has offered wide range of courses in the areas of Agricultural Economics and Agribusiness for both under graduate and graduate students. He has acted as chairman / member, Board of Studies, Academic council and Board of Management many Universities. Prof. Chengappa is/was associated with several academic bodies and policy making committees constituted by the Government; Member, Committee constituted by the Ministry of External Affairs, Government of India for Extending Agriculture Assistance to Sri Lanka. Member, Scientific Committee, Food Safety and Standards Authority of India. Member, Knowledge Commission, State Farmers’ Commission and Biotechnology Task Force constituted by the Government of Karnataka. Served as Member- Working Group of Planning Commission of India on Agricultural Marketing Infrastructure, Secondary Agriculture and Policy, and sub group on Agricultural Education and Research. Member, Governing Body of Indian Institute of Forest Management, Bhopal. Member, National Steering Committee of National Agricultural Innovation Project, ICAR. Chairman, Review Committee on the functioning Krishi Vigyan Kendras of ICAR located in North East region of India. He was a member of the Indian delegation convention on Biological Diversity held at Hyderabad during October, 2012. Nominated to the Roster of Experts as per the provisions of the Cartagena Protocol on Biosafety, Government of India. His international work experience include working as consultant at International Food Policy research Institute, Socio Economist at International Plant Genetics Research Institute and International Crops Research Institute for Semi- Arid Tropics; Visiting Scientist, International Rice Research institute; Facilitator, International course on Agricultural Marketing, DSE Germany; consultant, FAO Regional office Bangkok and visiting Scientist at Universities of Reading, Wales, Purdue and Iowa State University. Chengappa’s research efforts have resulted in 86 research articles in nationally and internationally peer reviewed journals, 9 popular articles, 2 books and 12 chapters in edited books. He was president (Elect), Indian Society of Agricultural Economics 2012 and President, Agricultural Economics Review Association, New Delhi during 2013-16. Conferred National Fellow Award by the Soil Conservation Society of India, 2009. Mruthunjaya completed his school education in 1964, graduation (1969) & post- graduation from UAS, Bangalore in 1971 and Doctoral degree from IARI, New Delhi in 1976 with high merit, distinction, recognition awards, several gold medals and Jawaharlal Nehru Outstanding Ph.D thesis award in Agricultural Economics from ICAR in 1976. After serving as lecturer at UAS, Bangalore during 1971-73, joined ARS as a scientist in 1976, served at IIHR, Bangalore up to 1981, in CAZRI up to 1983, and in IARI as Professor and Principal Scientist till 1994. At these ICAR institutions, using advanced quantitative tools and techniques, he has made significant research contributions in measurement, modelling and economic, technological, institutional and policy analysis of growth and instability in production, consumption, income, savings, investments, employment, supply, demand, storage, credit, marketing, transportation, storage of field, horticultural and plantation crops, livestock, fisheries and NRM issues. He has also taught courses at undergraduate and PG levels at UAS, Bangalore and IARI, New Delhi and guided M.Sc. and Ph.D. students at IARI. Dr.Mruthyunjaya has published more than 100 refereed research articles. He is a fellow of NAAS and Indian Society of Agricultural Economics, Mumbai. During 2017, he is bestowed with prestigious Dr.M.S.Randhwa Memorial Award by NAAS, India for his life-long contributions in agricultural administration, social sciences and transfer of technology. Dr. J. K. Ladha has devoted more than 32 years to aspects of sustainable management of agriculture and natural resources for increasing food security and environmental quality in developing countries. He is an expert of soil fertility and plant nutrition; serving at different positions since 1980. Currently, he is a Principal Scientist, and an adjunct senior scientist at the columbia University; associate in the Agricultural Experiment Station at the University of California-Davis. Dr Ladha provided leadership to the Cereal System Initiative System for South Asia and the Rice-Wheat Consortium Project that aims to sustainably enhance the crop productivity. He was a “Frosty” Hill Fellow at Cornell University (July 07–June 08) and an adjunct professor of Soil Science at the University of the Philippines (1990-2004). He was born and grew up in Gwalior, India, and earned his PhD from Banaras University in 1976. Dr. Ladha is recognized internationally as an authority on sustainable resource management for increasing food security and environmental quality. He has made immense contributions to international agriculture through his research, training, and extension activities in several Asian countries (Bangladesh, India, Nepal, Pakistan, Philippines, and Thailand) on problems across national and regional boundaries. Dr. Ladha is one of those unique scientists who have demonstrated success in conducting both basic and applied research. He has had an opportunity to pursue the full spectrum of basic, strategic, and applied research to find insights and develop technologies to solve farmers’ problems. Dr Ladha has published widely on issues related to sustainable and conservation agriculture. The impact of Dr. Ladha’s work is evident from his exceptionally high h-index for citations (Google Scholar, 69; Web of Science, 51; Scopus, 50). He served on the editorial boards of several international journals including the Regional Editor of Biology and Fertility of Soils. He has been involved with several international advisory/scientific review panels. He supervised 35 master’s and doctoral students from a dozen countries. He is a fellow of the American Association for the Advancement of Science (AAAS), American Society of Agronomy (ASA), the Soil Science Society of America (SSA), the Crop Science Society of America (CSSA), the Indian Academy of Agricultural Sciences (NAAS), and an associate member of the Philippine Council of Agricultural Research (PARC). He is a recipient of several awards and honors notably, the Third World Academy of Sciences Agriculture Prize 2015, the International Crop Science Award 2015, the International Service in Agronomy Award 2011, International Soil Science Award 2010, International Plant Nutrition Institute Science Award 2009. In 2000 and 2004, the CGIAR awarded the Chairman’s Excellence Science Award for Outstanding Scientific Partnership and the prestigious King Baudoin Award for Outstanding Research to the Rice-Wheat Consortium in which J. K. Ladha was the key scientist and IRRI’s coordinator. Dr. Elumalai has a Master's degree in Agricultural Economics from CCS Haryana Agricultural University, Hisar and a Ph.D. degree in Economics from Jawaharlal Nehru University (JNU), New Delhi. His areas of research interests include agricultural economics, international trade, futures market, natural resource management, institutions and rural development. He has worked at various reputed institutions such as National Centre for Agricultural Economics and Policy Research, New Delhi, International Maize and Wheat Improvement Centre, New Delhi Office, National Council of Applied Economic Research, Madras School of Economics, Chennai and Institute for Social and Economic Change, Bangalore. Presently, he is working as Associate Professor at the Centre for the Study of Regional Development (CSRD), Jawaharlal Nehru University, New Delhi. Dr. Elumalai served as a Consultant to various international organisations such as World Bank and FAO. He was a visiting scholar at the University of Saskatchewan, Canada. During recent years, he has undertaken important research studies on inclusive agricultural growth, stagnation in productivity of important crops in India, agrarian change and farm sector distress, pre and post harvest losses, agricultural market reforms, impact evaluation of National Agriculture Development Programme, impact evaluation of Soil Micronutrients Programme, comparative advantage in export of agro-processed products and India's textile and textile products. A.V. MANJUNATHA obtained MSc in Agricultural Economics from University of Agricultural Sciences, Bangalore, India and International MSc in Rural Development from University of Gent, Belgium. He holds a doctoral degree in Agricultural Economics from Justus Liebig University Giessen, Germany. He has experience working in several national and international projects and involved in drafting policy documents for the state and central Government. He has published research articles in high ranking journals, conferences and leading national newspapers. His main research areas include Natural Resource Management; Agricultural water management; Agricultural markets; Impact analysis of developmental programmes and technology adoption; International Trade; and Energy and climate change in Agriculture. Currently he is serving as Assistant Professor in the Agricultural Development and Rural Transformation centre of the Institute for Social and Economic Change, Bangalore, India.